The Open Vulnerability Assessment System (OpenVAS) is a framework of several services and tools offering a comprehensive and powerful vulnerability scanning and vulnerability management solution. The actual security scanner is accompanied with a daily updated feed of Network Vulnerability Tests (NVTs), over 35,000 in total (as of April 2014). The OpenVAS Manager is the central service that consolidates plain vulnerability scanning into a full vulnerability management solution. The Manager controls the Scanner via OTP (OpenVAS Transfer Protocol) and itself offers the XML-based, stateless OpenVAS Management Protocol (OMP). All intelligence is implemented in the Manager so that it is possible to implement various lean clients that will behave consistently e.g. with regard to filtering or sorting scan results. The Manager also controls a SQL database (sqlite-based) where all configuration and scan result data is centrally stored. Finally, Manager also handles user management includiung access control with groups and roles. 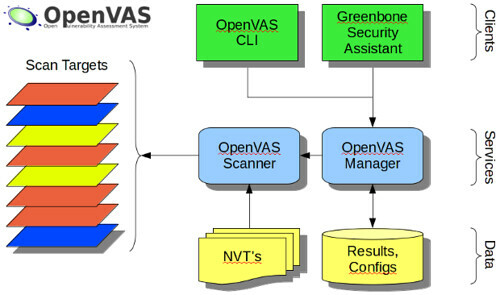 We haven’t written about OpenVAS for 6 years, when it first forked off from Nessus back in 2008. It sure has come a long way since then, especially with the fully stocked NVT feed – it’s become a pretty powerful tool with a well thought out architecture. Still today it’s pretty much the only fully fledged Open Source vulnerability scanner out there. Reports Format Plugin Framework with various plugins for: XML, HTML, LateX, etc. Runs on Windows, Linux, etc. The powerful and comprehensive OpenVAS solution is available as Free Software and maintained on a daily basis. This is because of dedicated contributors and sponsors.